Had I enough cooked rice on hand, I'd have stratified that in as well. To use up the last couple quarts of game night chili, I recently casseroled my cache and topped the whole thing with a bag of crushed Central Market organic corn chips (otherwise known as “fritos” around here). Melded with middle layers of mashed baked Texas sweet potatoes seasoned with salsa and a generous mop of Organic Valley pepper jack, I served up steamy scoops atop Lowell Farms Texas-grown organic jasmine rice, to rave reviews. Let’s hear it for luscious leftovers! I won’t attempt to taunt Texans with my chili recipe, but I will admit to a 3:1 ratio of Richardson Farms’ beef and pork. Plus my homemade chili powder, a can of Lone Star (the national beer of Texas) and in the interest of full disclosure, I’ll fess up to adding organic canned tomatoes and slow-cooked organic black beans (I swear I’m not trying to be irreverent). Chili how you choose, and resurrect the remainder. Cooked dal is not so photogenic. Check out chana dal in the raw. I’m cold and I have a cold so I want soup. Fresh local dill is easy to find right now and I bought a large, lush frondly bunch from Finca Pura Vida at the fledgling HOPE market on Sunday. If it snows today, and it might, I’ll transport myself to Shangri-la via Kashmir with a warming bowl of hot dal and rice. Keeping things simple and utilizing the pressure cooker to speedy up my fantasy. Potentially exotic ingredients are called for here: chana dal, garam masala (you can make this yourself—see bonus below), and asafetida. Down south (Austin), you’ll score the best buys on harder-to-find Indian staples at Fiesta (Stassney and I-35). Up on the north side, I patronize MGM. Those folks are nice and the selection is great. Sometimes you can even find little potted curry bushes. You can keep them in a (bigger) pot to bring inside for the winter, or you can transplant them outside. They’ll freeze to the ground, even covered up (although we haven’t tried Christmas lighting them for warmth). But when the weather heats up again, and you know how it will, your curry bush will greenly resurrect and once again you’ll be wondering when you’ll ever get a chance to make up a large batch of curry leaf-based curry powder to share with your friends. Happens every year. heaping 1 cup of chana dal, picked through, soaked for 5 hours and rinsed. 1 bay leaf–We’ve been growing for years, so we use ’em fresh. 1 ½ teaspoons salt. I use Real Salt. 1 or more cloves of garlic, smashed. Local garlic not synchronizing with local dill this time of year, you can omit this ingredient. Or use domestic organic. ½ cup chopped fresh locally-grown dill. Easy to find right now. Maybe in your own yard! I save the stems for stock. ½ teaspoon garam masala. See Bonus recipe below. 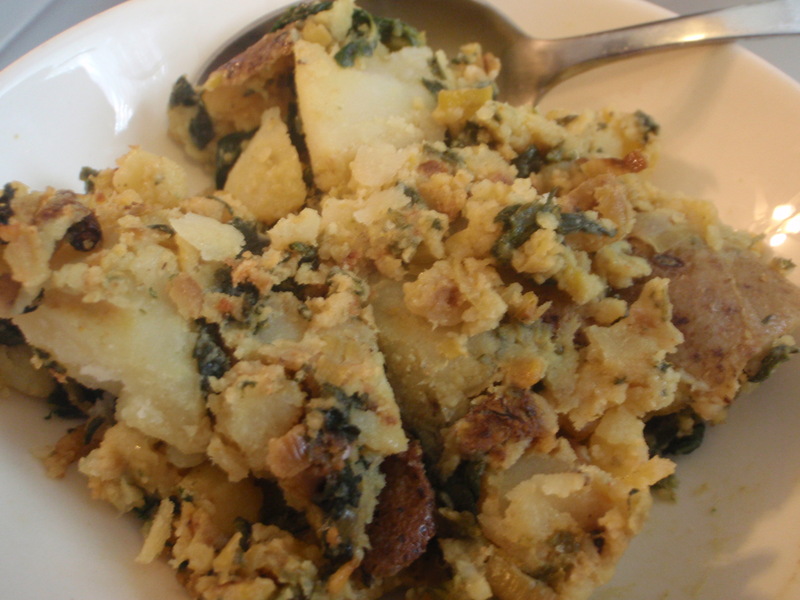 1 Tablespoon plus 2 Tablespoons ghee (divided use), preferably homemade from organic butter. See my simple instructions. 1 to 6 dried whole red chiles. You can crush these up a bit if you want to feel the burn. ¼ to ½ teapsoon powdered asafetida. Click the link to read about this odiferous spice’s potential for combatting H1N1 as well as other respiratory afflictions. I wouldn’t omit this unless you use plenty of garlic. Then I still wouldn’t leave it out. I love that stank! fresh lemon, if desired—Local Meyers or regulars are great—otherwise go for organic. 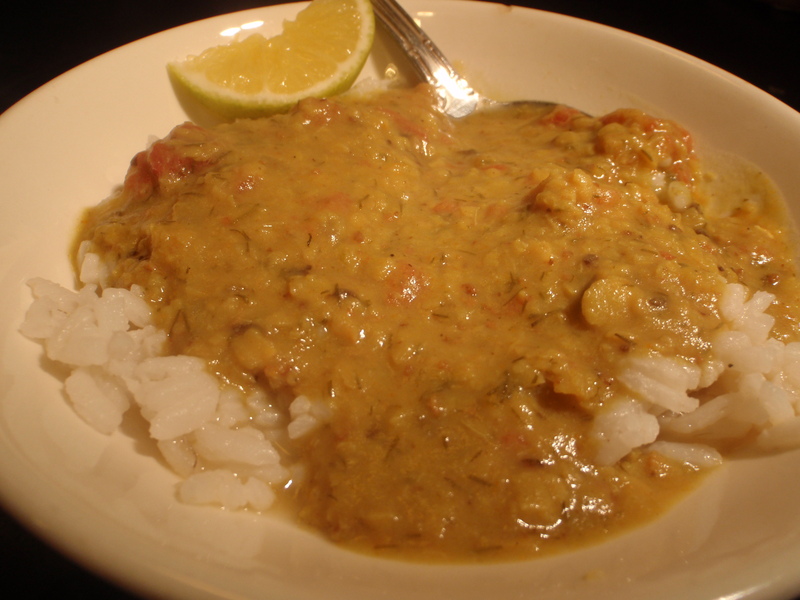 If using a pressure cooker, place dal and the next seven ingredients, plus the 1 Tablespoon of ghee in the pot. Lock the lid on and bring to high pressure over high heat. Turn the heat down to maintain consistent pressure and cook for about 20 minutes. 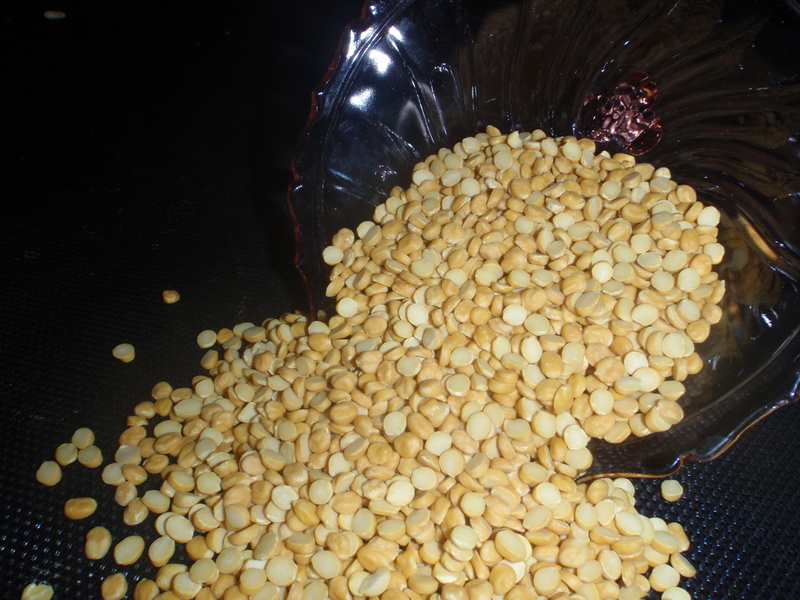 The cooking time for softening your dal will depend on the age of the beans. If the chana dal has been sitting in your pantry for a while, or languished at the store for too long (less likely at an Indian foods market), expect a lengthier cooking time. At any rate, check the dal after 20 minutes. Take the pot off the heat and let the pressure drop for 10 minutes. Release the rest of the pressure by flipping the quick-pressure release switch (however that works on your appliance). Be sure to open the lid AWAY from your face and arms to avoid steam burns. The dal should be soft and broken down. If it’s undercooked, give it another five minutes or so. If you’re not in a hurry you can finish cooking the dal without pressure. 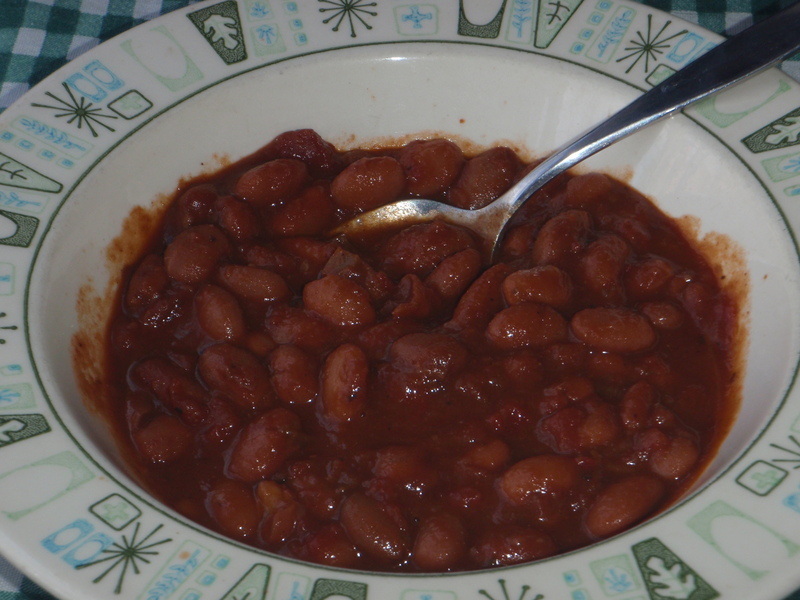 If you’re really trying to kill some time, you can do all the bean boiling in your regular soup pot. It’ll probably take at least an hour. Using an old-fashioned egg beater or a whisk, agitate the dal into a rough puree and correct the salt, if necessary. Now for the chaunk (or tarka or bagar or a number of other similar terms). Heat the 2 Tablespoons ghee in a small skillet over medium-high heat. As soon as it melts add the cumin seeds and chiles. Monitor the spices as they fry and toast and when they look and smell just right to you—as browned and roasty as you please—quickly dump in the asafetida and give the pan a swirl before adding the onions. Get ’em browned a bit then add the tomatoes and fry the mixture until the tomatoes break down and glisten with ghee. Pour the chaunk into the dal pot and let the flavors get acquainted for a couple minutes before serving. Ladle over rice, or not, and brighten with a little lemon juice if you think it needs it. No one minds a flatbread on the side, either. Place all the spices in a medium skillet over medium heat. Toast, shaking the skillet occasionally, until the coriander seeds have browned a shade or two darker and the spices smell righteously roasty to you. This is YOUR garam masala, so trust your senses, especially your smeller. When the spices have finished blooming, transfer them to a shallow baking pan, preferably aluminum or other thinner metal, to cool. When fully cooled, decorticate (remove the pods from) the cardamom and grind all the spices together in a spice grinder. I use a Krups coffee grinder from the thrift store (of course). Stir the ground mixture to blend well and store in a jar in the refrigerator for greatest shelf life. In honor of Dai Due Supper Club’s upcoming goat gathering (Goat Head-to-Tail September 13th at Hotel Saint Cecilia), I’m posting great goat recipes. Be sure to check out Kebabin‘. We’ve been enjoying Premium Lamb’s recent presence at the Sunset Valley Farmers Market. For an easy-to-eat goat meat treat, try these Caribbean-inspired meat patties. Even the kids can help. a Tablespoon or so of olive oil, local if you can afford it. Texas Olive Ranch‘s arbequina varietal is smooth and buttery. a couple of green onions, chopped, if you have some. I’m not bumping into local bunches right now, so I left them out. I threw in some chopped garlic chives (which we grow, effortlessly) at the end instead. some chopped, colorful varieties of sweet and/or hot peppers, a half cup or so. Use what you have. Lately Flintrock Hill has been selling lovely little bright orange sweet peppers as well as golden Anaheims (mild). Scotch Bonnet is traditional, but we have children around here. 1 medium green apple, peeled and shredded. We sure are enjoying Love Creek Orchard’s fresh and crispy harvest of assorted varieties. You can vary this addition seasonally by substituting pear, summer or winter squash, radishes, cabbage or leafy greens. Be flexible! 1 1/2 to 2 teaspoons curry powder. I use a Caribbean style blend that I make. 1/2 to a whole egg, beaten. Local eggs, please. salt and pepper to taste—I use about 1 teaspoon salt. In a large (12″) skillet, heat up your olive oil on medium to medium-high heat. Saute the onions and peppers until softened, then add your apple and garlic. Stir for a minute, releasing the garlic’s aroma, then add the curry powder and thyme. Stir around for another short minute before adding the meat. Continue sauteing, stirring occasionally to break up the meat, until it’s cooked through. Adjust your heat as necessary. When the goat looks done (no pink), stir in the beaten egg and cook the mixture up for a minute before seasoning with salt and pepper. Remove the pan from the heat and allow the mixture to cool completely (to room temperature) before either refrigerating for later assembling, or moving right along into production. 2 sticks butter, softened but cool. Organic Valley. 4 ounces (1/2 an 8 oz. package) cream cheese, softened but cool. Organic Valley’s my choice here again. Click for coupons. 2 teaspoons sugar. Central Market and Whole Foods sell organic granulated sugar in bulk for $1.49 a pound. 362 grams (3 cups) organic flour. I like a mix of all-purpose flour and as much as half (181 grams) whole wheat (white or regular) —I find WF offers the best everyday deals on flour. Combine butter and next 3 ingredients in a mixer bowl. I use my stand mixer. Beat mixture with the paddle until well blended and creamy. Beat in flour (and allspice, if using) just until combined. Lay out a piece of foil on your work surface. Helpful children can get involved at this point. Scoop up 1/4 cup of dough and use the heel of your hand to press and form it into a 5″ circle. 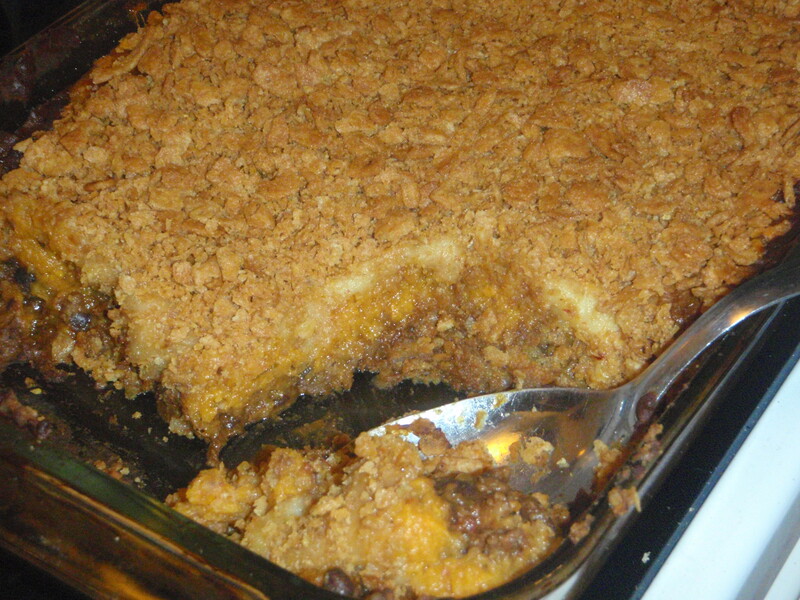 Grab about 2 heaping Tablespoons of filling and squeeze it in your fist to form a log shape. It should hold together. Lay your log on one side of your dough round (a little off-center). Using the foil, fold the other half of the dough evenly on top of the filling to enclose it. Still using the foil, press the edges together to seal the pocket. Carefully peel the foil away from the patty. If your dough misbehaves, clinging truculently to the foil, give it a bit of a cool rest in the fridge. That’ll show it who’s in charge! Tidy up the edges with your fingertips, making sure they’re well-sealed. As you form the your goat boats, lay them on a cookie sheet. I use 2 sheets if I’m baking the full batch. Bake in a preheated 400º oven for about 19 minutes, until golden brown. Let cool until handleable. I like that word. You can form all the boats and bake only what you’d like to eat now (3 or 4 may fit in your toaster oven—saves energy). I haven’t tried freezing them (baked or unbaked) ’cause we eat them up. You can bake the whole batch and store your patties in the fridge for a couple days. Reheat in the toaster oven—you may want to use foil to guard the edges against overbrowning. But folks around here just eat ’em cold! This blend does not contain cumin. 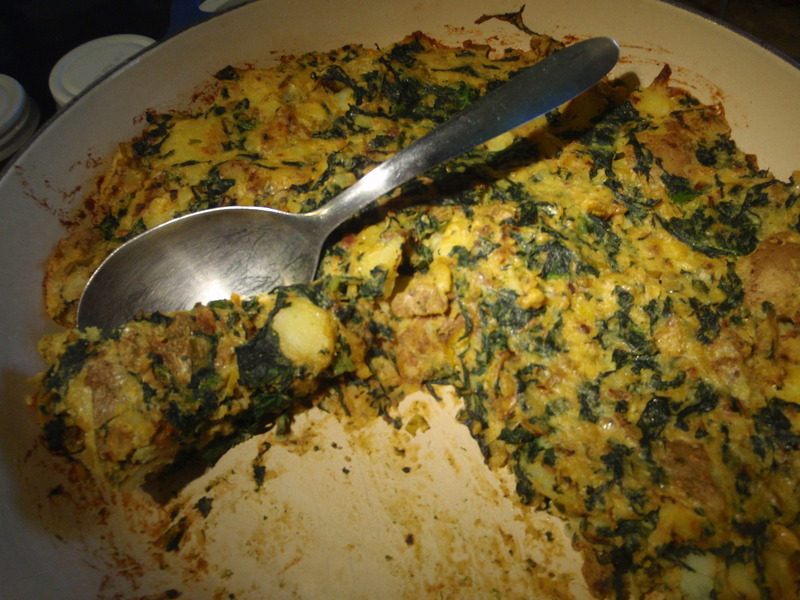 If you crave the comino, by all means include up to 4 teaspoons cumin seeds in the roasting pan. Place the first four spices in a small skillet and roast over medium to medium-low heat until they become fragrant and are beginning to brown. Add the fenugreek and toast another quick minute or so, just until you can smell the mapley aroma of the fenugreek. Dump the spices into a dish or an aluminum cake pan—for quickest cooling—and allow the mixture to cool to room temperature. Remove the cardamom seeds from their casings—this is tedious business—and grind up your blend in a spice grinder/coffee mill. Whisk together well with the turmeric and ginger. Jar it up. I store mine in the fridge. Ya mon.